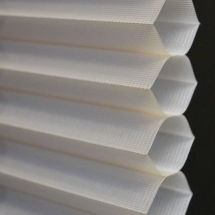 Two window shades in one! 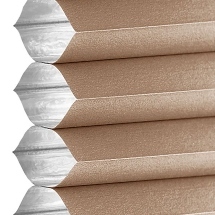 Our Premier Day & Night Shades offer the privacy of blackout shades as well as the light control of sheer shades. 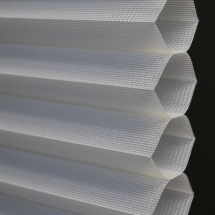 Perfect for letting filtered light into the room or lower the blackout shade for privacy and light control. 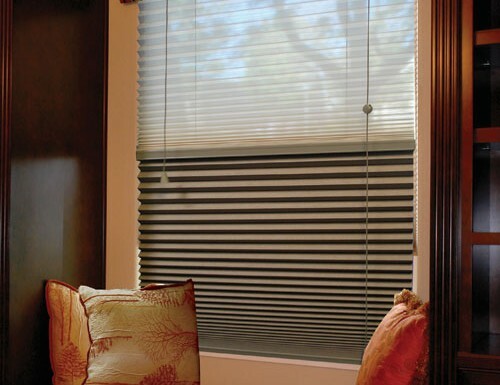 Both the blackout shades and the sheer shades are mounted with the same headrail. An additional color coordinated rail separates the two fabrics. Each fabric has it's own lift cord. One for the sheer and one for the blackout. 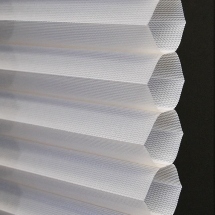 Color between the translucent and the blackout fabrics may vary slightly due to the blackout liner inside the honeycomb cells. W: 7" 8" 9" 10" 11" 12" 13" 14" 15" 16" 17" 18" 19" 20" 21" 22" 23" 24" 25" 26" 27" 28" 29" 30" 31" 32" 33" 34" 35" 36" 37" 38" 39" 40" 41" 42" 43" 44" 45" 46" 47" 48" 49" 50" 51" 52" 53" 54" 55" 56" 57" 58" 59" 60" 61" 62" 63" 64" 65" 66" 67" 68" 69" 70" 71" 72" 0/0"1/8"1/4"3/8"1/2"5/8"3/4"7/8" H: 5" 6" 7" 8" 9" 10" 11" 12" 13" 14" 15" 16" 17" 18" 19" 20" 21" 22" 23" 24" 25" 26" 27" 28" 29" 30" 31" 32" 33" 34" 35" 36" 37" 38" 39" 40" 41" 42" 43" 44" 45" 46" 47" 48" 49" 50" 51" 52" 53" 54" 55" 56" 57" 58" 59" 60" 61" 62" 63" 64" 65" 66" 67" 68" 69" 70" 71" 72" 0/0"1/8"1/4"3/8"1/2"5/8"3/4"7/8"
Are these single, or double cell? 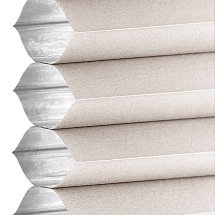 The Premier Day & Night Shades are single cell shades. I am very happy with my Day & Night shades. I am very happy with my Day & Night shades. Ordering was easy and the blinds arrived faster than I expected. 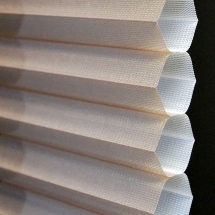 The blinds are made out of nice materials and the installation was easy. I love that one blind can be both light filtering and blackout. Thank you for the wonderful product. I replaced my day & night shades that I had since 1996, blind chalet price was about the same price of my 1996 purchase. I replaced my day & night shades that I had since 1996, blind chalet price was about the same price of my 1996 purchase. My order was delivered in two weeks. Awesome quality, fast delivery, fantastic prices. 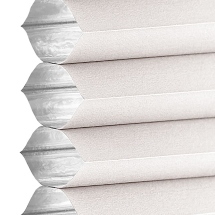 We received the blinds in a timely fashion. We received the blinds in a timely fashion. They were very easy to install and they look wonderful. We think it cuts down the outside noises. Hopefully they will save energy. Thanks to Zachary for all of his help.